Outdrive how to repair video,s that show tools and new or used OEM parts if required. See model and hp. listed below. How to video for 400/800 pressure testing upper-lower units and make your own pressure testing unit. 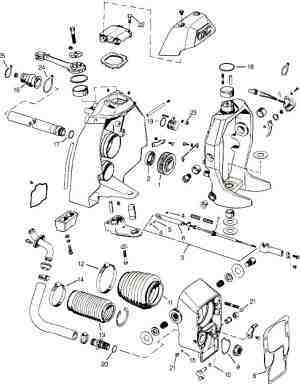 Please see home page for OMC parts look up. 400-800 stern drive upper gear-case. That is ball gear drive units for years 1971 to 1985. P/N 11410 stainless steel water pump shaft with stripped male spline from fast starts and lower unit propeller impact. Rebuilt upper gearcase case assembly with GLM aftermarket OMC parts with new gears, drive shaft, water pump shaft, housing, bearings, ball gear, seals and water pump housing. Exhaust housing parts and tops for 400-800 Stringer outdrives. OMC Stringer stern drive upper gear case for years 1968 to 1977 with both press on and bolt on ball gears. Case may come with or with out true coarse steering installed. Need a rebuilt upper gearcase click here for pricing details on our remanufactured units. 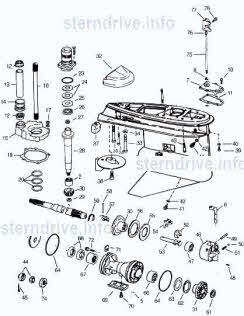 400 Series OMC stern drive lower gear case exploded view drawing for years 1982 to 1986 with 3-1/4 inch smaller hub. Drive shaft, gearcase, propeller shaft, drive shaft, bearing carriers and bearing retainers. OMC stern drive years 1982 thru 1986. 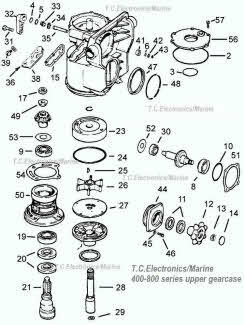 Lower unit components drawings are divided into 3 section. 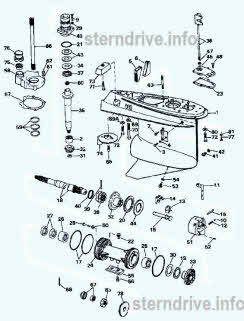 1st drawing part numbers 1 to 22, second drawing part numbers 23 to 48 and third drawing part numbers 49 to 72. 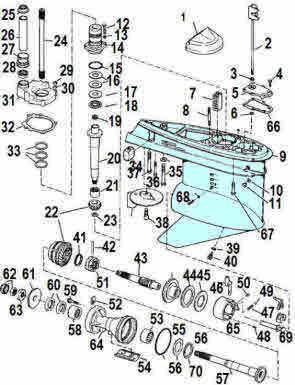 Layout show GLM Marine P/N, photo and OEM numbers of each component listed in gearcase. Seized bearings from low oil levels or water in the oil. Propeller impact damage resulting in broken gears and bent propeller shafts. Old cracked seal that are 15 plus years old. 800 series for the following years: 1982, 1983, 1984, 1985 and 1986 lower unit gear-case. Large hub, drive shaft, drive shaft bearing, shifter rod and prop shaft installed. Common replacement components are the same items as 400 series lower unit. Stern drive is identical except for housing hub size on 800 series that is 4-1/4 inches, about 1/2 larger than the 400 series. Clutch spring and forward gear assembly from engine idol speeds over 650 rpm. Broken shifter switch that hold only intermittent contact. Upper drive shaft bearing from low oil levels. 400-800 and electric shift Stringer stern drive intermediate housing. 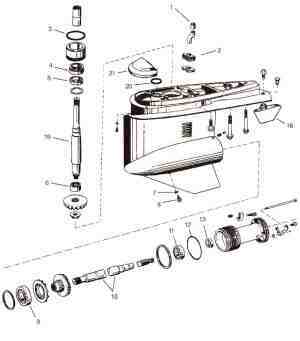 Drive shaft ball gear due to normal wear or running the boat with stern drive not all way down in the water. 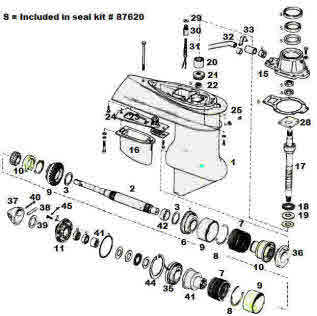 Bearing due to low oil or cracked seals. Drive shaft splines that did not have updated shafts installed. Clutch packs that have water entering due to cracked seals that are in most cases 20 plus years old. 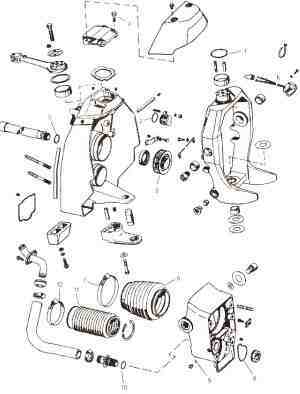 Cobra with u-joint driven drive shaft for years 1986 to 1992 and (1988 King Cobra) upper gearcase components. Broken gears or seized bearing from improper filling of upper/lower gearcase. Worn out water pump and yoke area seals on unit with 800 hours or more. Propeller impact damage resulting in broken gears and bent propeller shafts. 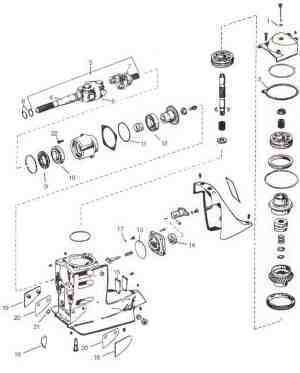 How to repair video series for OMC outdrives show exploded view OMC cobra parts drawing. However we have 25 plus repair videos listed at time of listing. 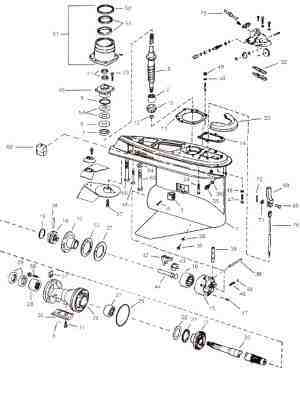 Click on you-tube icon to and select videos to see actual repairs, tools and parts required. Contact the order desk if having problem with your repair as we have a no charge tech service representative who will help you if required. 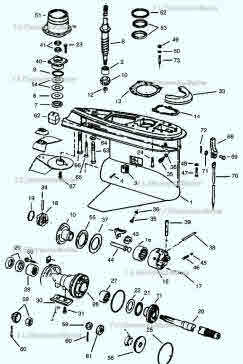 In most video,s tools and repair parts are listed by GLM part number. 1988 to 1993 V6, V8 counter rotating large hub 4-1/4 inch lower unit. First off this drive is not common and can be damage buy using a Cobra bearing carrier puller when changing the seals. Propeller shaft is only 12 inches long and part of the bearing carrier unit. This outdrive should only be service by a marina that stock the parts to repair it. King Cobra 1987 to 1989 V8 for 7.4 and 7.5 liter engines with hub size of 5 - 3/4 inch. Please note: the true King Cobra lower unit should only be used for the 7.4L (454) and 7.5L (460) motors. For the 5.7L (350) and 5.8L (351) motors, use the standard OMC Cobra lower unit gear-case parts. 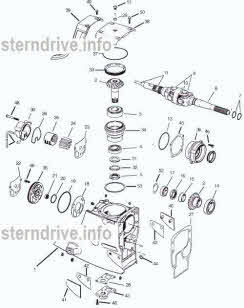 Used parts that may not be listed here are the lower gear case, gears, clutch dog and propeller shafts. Please contact order desk for availability. Shift cable need replacement every 4-5 year unless shifter update has been installed in lower unit, if so then about every 15 years. Broken or cracked u-joint bellows and exhaust bellows that are 10 plus years old. Gimbal bearings that have not been grease every 50 hr. or 1 a year. OMC engine exhaust failures with over heating problems can sometimes be traced to the exhaust systems. 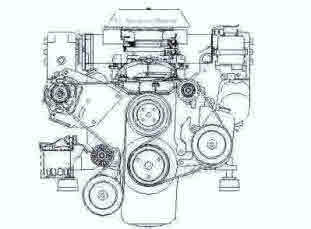 However before manifold unit or engine is replaced check the water pump flow to the engine. Test is done by testing the time to fill a 2 gallon container at idle speed of 550 rpm to 650 rpm. Bent propeller shafts form impact damage and cracked seals that are 15 plus years old. Shift cable need replacement every 7 to 10 years. Gimbal bearings that have not been grease every 50 hr. or once a year.